Poland have battled hard to reach the Quarter Finals of Euro 2016 without ever looking completely convincing, even conceding no goals in the first three matches. They started the group stage with a 1-0 victory over Northern Ireland, drew 0-0 with Germany and narrowly beat Ukraine in the third and decisive match. They qualified for the quarter finals via a penalty shootout against Switzerland as the both team held out to 1-1 stalemate after 120 minutes of action. Talismanic forward Robert Lewandowski yet to find the net. Head coach Adam Navalka welcome midfielder Bartosz Kapustka back from suspension, and he could come into the side at Grosicki's expense. Robert Lewandowski is expected to shake off a minor thigh complaint while Lukasz Fabianski is expected to retain his starting berth in goal even if Wojciech Szczesny can recover in time. Blazczykowski, Krychowiak and Maczynski are expected to start in midfield, as well as Arkadiusz Milik up front. Portugal have struggled in their last four games, finishing third in Group F behind Hungary and Iceland and advancing to knockout stages without winning a match. They finished all square with Iceland (1-1), Austria (0-0) and Hungary (3-3) Furthermore, Portugal required extra time to see off Croatia 1-0 in Lyon in the last 16. Actually, they are in the quarter-finals but they failed to win all the 4 games in regular time so far. Boss Fernando Santos has doubts over full-back Raphael Guerreiro, midfielders Joao Moutinho and Andre Gomes, but all three are expected to be fit. Adrien Silva, Cedric Soares and Jose Fonte profited with their first appearances of the tournament against Croatia and they could be rewarded with another start here. Portugal (4-4-2): Rui Patricio – Soares, Pepe, Fonte, Guerreiro – Joao Mario, Adrien Silva, William Carvalho, Andre Gomes – Nani, Ronaldo. 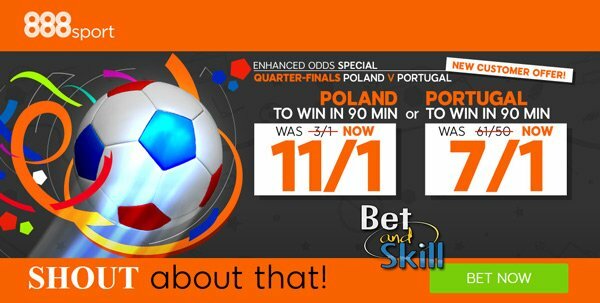 "Poland v Portugal predictions, betting tips, lineups and odds (Euro 2016 quarter finals - 30.6.2016)"